Voracious reader – a phrase that easily describes me. I adore a good book, so a published one is a word gift I often give myself. If it’s truly amazing, I can’t wait to tell someone else about it so they can experience the gift of words for themselves. 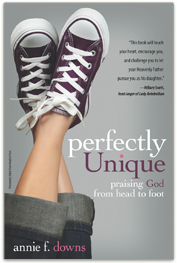 I recently came across a book entitled Perfectly Unique: Praising God from Head to Toe by Annie Downs. It’s written with the teen girl in mind, and I knew that my sweet Sassafras needed it to help her navigate the confusing and difficult transition from tween to teen. The world around her, including media, parents, and peers, each feed a portion of her identity. The problem is some of those sources seek to make her define herself in unachievable terms – the perfect body, the perfect student, the most popular girl, etc. Often they will encourage her to seek the identity of someone else, someone she deems more worthy than herself. Perfectly Unique encourages girls to recognize that they are specially crafted instrument of God. It helps them understand that each step they make, action they take, and word they speak can be a way to serve God. By the last page, girls discover that their uniqueness allows them to be a one-of-a-kind creation able to change their world for God. If you haven’t invested in someone’s life recently, here’s your chance to offer a word gift that you didn’t have to write – offer them an already published one. Many of us have read books that have helped shape our lives, transform our thinking, and equipped us to happily live the life God has called us to. Why not share that book with someone who might need it? Stop today and think of a book that encouraged you and decide who could benefit from a published word gift. This entry was posted in Book Reviews and Recommendations, Spiritual Encouragement, Word Gifts on October 10, 2012 by aliciachall28. Make that “glorified” not florified.